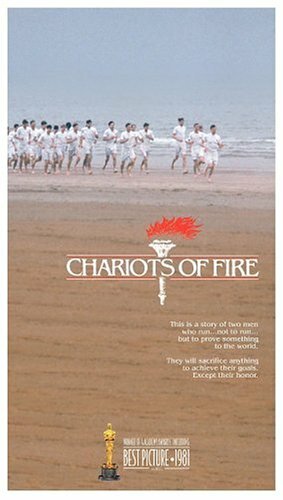 Before this wide-screen edition of CHARIOTS OF FIRE was released, I was extremely reluctant to recommend buying this DVD. Now that it is out, and that the sound has been made crisper, there is nothing that should prevent anyone from buying this product. We all know the story. It's one of those films that no one can seem to find a middle ground on. Either you love it or it bores you. For me, CHARIOTS OF FIRE is one of those great films that stays with you for years. I had seen it when it was first released in theaters way back when. Upon viewing it again, after 25 years, I felt as if I'd remembered every scene, as if it were yesterday. And in an era that was just beginning to see films dominated by computerized effects, director Hugh Hudson pulled out the unexpected: an upbeat story, with a cast of mostly no-names (Gielgud and Holm, excepted), that features real characters. Chariot's is one of my favorite movies. The character presentations are very good. Eric is one of the most likable people on the screen. He manages to make sanctity attractive. Honor is easily made attractive in movies and has been done hundreds of times. But sanctity is easily confused with sanctimoniousness. Moreover even when one sees it it is frightening in some ways. But Eric is not merely a good person. You really can feel God in him even in a movie. And yet he does not seem forbidding. He seems like someone you can talk to. He does not, even unintentionally talk down to people, and his sermons are splendid examples of the rhetorical art. Abrahams is the troubling one. Some reviewer said that many Jews were annoyed by the characterization of Abrahams. Harold is intense, determined and perpetually angry except in those few momments when he softens. He has a ruthless determination. He is also perpetually suspicious and can't quite bring himself to return friendship. Every time I watch the movie I think "pity the poor Arabs!" You can pity him, and respect him, but you can't like him. But that is not the troubling part. For Harold in the movie, reminds one of something C.S. Lewis once said. If you do wrong to someone, the wrong doesn't merely consist of what was taken from him by the act itself, but the fact that one has momentarily taken the position of Satan and done harm to his soul. You have not merely hurt him, you have taught him to hate. The boys at Cambridge are actually very friendly. But they weren't what made Harold like that. It was the boys in earlier schools where the natural cruelty of boys toward any who is different was tolerated. The best expression of this thought is the scene where he swears to "run them off their feet" to the background of He is An Englishman. Harold was indeed an Englishman but England had forgotten what that meant in his case. Another scene which few have noticed was the scene of the Prince of Wales urging Eric to put Country before God. What is not noticed is that he was Edward the VIII-the same one who later became involved with fascist politics(to be fair it was probably mostly shallow celebrity-foolishness then anything else). Mr Patriotism indeed! Which shows that if you exagerrate a normal and healthy loyalty out of place, that loyalty can itself become corrupted. The Prince demanded loyalty to country in the place of God-and in the end failed to be loyal to country. For the rest the show was a splendid display of an idealization. That is not a denigration but a praise. The fact that aspirations are impossible does not mean that one should not aspire to them. Chariots shows the spirit of friendship between young men. This is shown when Lindsey joins Harold on the dash, "I run beside my friend", to support him. The movie also shows the kind of patriotism that depends on a love of ones country and has nothing to do with hatred of others. The "cosmopolitanism" of the games as shown is the celebration of each nation and the pleasure taken in it by others-the joy of all in the love each has for what is their own. It is not "multiculturalism" in the modern sense, for to often that appears forced or depends on rivalry-is simply another form of "nationalism" in it's worse connotations. While the Olympics are by definition competitive, they are(as pictured) not competitive in the sense of requiring animosity. It is a picture of men and nations sharing friendship by their competition a paradox which many find hard to understand. Chariots is a fine and splendid movie. It is not an action movie. It is far more. One of the things that will strike you after you see this classic is how honest and wholesome the races feel. It is not hard to fathom this - there are no ads to be seen anywhere! In the stadia, you see only athletes competing minus all the promotional paraphernalia and gaudy uniforms. And yes, drug abuse is unheard of. This is a wonderful story that will take you back to the days when games were played for their own sake and to fulfil an inner urge - and definitely not for money. The music - ah! Vangelis knows how to capture the spirit of the story. The title track is well known (only downside is it is almost impossible to get it out of your head!) but be sure to pay attention to the rest of the score which is just as good. Great acting, wonderful settings, very realistic. A story about people who are driven by their desire to find fulfillment in giving it their very best at whatever they do. The story I find very inspiring; Eric Liddle is my hero, the kindest of persons, he is truly devoted to the people, and shares his kindness with them. There is such beauty in seing him run, in honor of God. The way friendship and support of loved ones, along with respect for others, are shown in this masterpiece, is very touching. This is simply an amazing movie, inspiring in a way that few are. I am fascinated by Mr. Liddel, and my only disappointment was that the movie portrayed his lovely sister in an entirely unrealistic light. She did in fact support her brother's running wholeheartedly and was one of his biggest fans. I suppose the screenwriter felt the need to add a little additional tension to a remarkable life. What an amazing film! This is the story of a real olympics and the participants who represented Great Britain in track. The main characters are really well developed and include Abraham who is attending Cambridge University and besides being a stellar student of law has been graced with the ability to sprint. He is Hebrew in a Christian world son to a financier. He enrolls a coach named Mr. Masanbini who admits he can't put in what god left out but none the less agrees to train the young Ben. The second major character is Eric Liddell of Scotland he grew up in China as the son of a missonary. He is Christian through and through but besides that he runs like the wind. Despite a calling to take up the missionary he decides to participate in the Olympics for England and Scotland. This movie is epic it has little comparisons in my mind and is something that makes me shiver. It is inspiring and I can remember watching it hundreds of times over the years. The movie is complemented by an amazing soundtrack by Vangelis who also did Bladerunner. This movie describes a period when England and the world were in the shadow of what may have been the most horrific war man has ever seen and from this shadow a few of Englands brightest young men shone inspiring not only their nation but the world. Really this is a must have! Be Warned: This DVD is NOT a true wide-screen! My God. They created this wide-screen version of "Chariots of Fire, Two Disk Special Edition" by chopping off the top and bottom (or just the bottom) of the old full-screen version of the same title. In other words, the old full-screen version has more screen to watch. I had never seen this movie until the fall of 1997 and after watching 40 minutes wondered, "What's the big deal?" Well, the second half of the film and then subsequent viewings have done more than just answer my question. It's one of the RARE movies in the past 30 years which portrays a Christian in a positive light. Ian Charleson does a convincing job of portraying a 100 percent sincerely good man who walks the talk. In here is also a good portrayal of a Jewish man, a student at Cambridge, acted well by Ben Cross. This man is too defensive about being Jewish and carries a chip on his shoulder until the end where he comes out a hero and a fine man as well, the bitterness gone. The story of those two men and their quest for a gold medal at the 1924 Olympics in France makes for an inspiring film. It's also aided by very nice photography and a wonderful score by Vangelis. A recently-issued widescreen DVD finally shows off the award-winning cinematography. The feel- good ending doesn't hurt, either, especially since these main characters were real-life people. Her extraordinary beauty made Alice Krige an interesting person to watch in the film, and I wonder why she never made it as a "big-name" actress. Perhaps that was her decision.